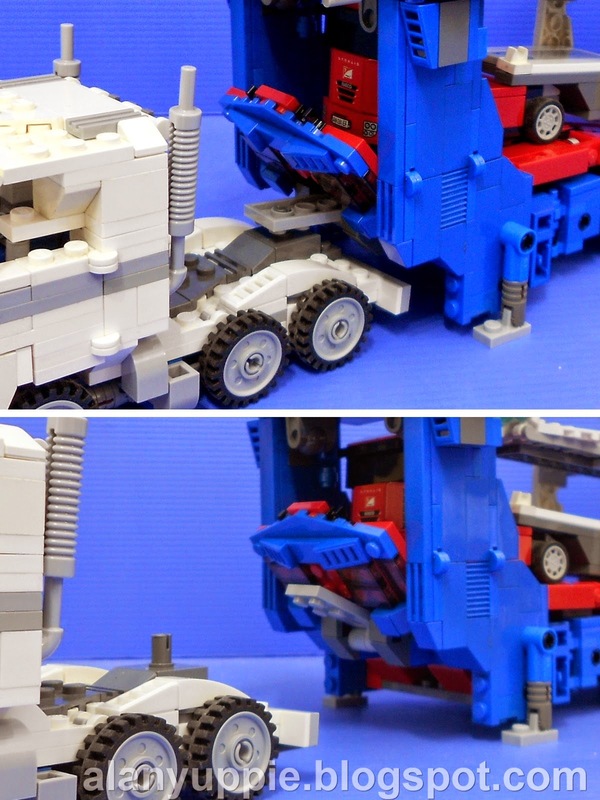 Ultra Magnus is a G1 Transformers character whose toy shared the same cab mould as G1 Optimus. So the original toy version transformed into a white colored Prime robot, with his car carrier forming an exo-skeleton/armor for him... increasing his size tremendously. I am splitting this MOC photos to be published in few parts. This first and second part will focus solely on the vehicle modes, because of the sheer number of photos I wish to share with all you guys! I always wanted the weapons held by the robot be integrated into the alternate mode. This is because I tend to misplace them if they're not provided a storage/connection port. The front part of the lower deck curving upwards is not intentional. This is caused by the pressure incurred by the whole trailer, and consequently, the trailer almost touched the ground! Luckily there's about 2mm clearance . I can still roll the vehicle back and forth , and the cab can still be rotated up to 40 degrees to either direction. phew! From the very beginning of this project, I insisted the trailer base to be of a single color (red) from end to end. But then I found out it's almost lacking details . So I decided to apply black stripes across the base. The grey hinged hooks shown below are last minute improvements. They act as stoppers to prevent 2 cars on top of the ramp from bumping into each other. 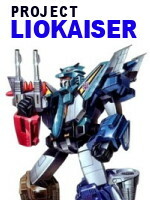 The rocket launchers can be flipped upwards , part of the transformation to form the robot arms. I found the back of the trailer in the G1 toy to be pretty bland with a singular color tone (blue). I decided to apply grey stripes across them, and at the same time put in more safety features befitting real life vehicles.... foglamps! You might be wondering what is the purpose of the dark grey extensions on the back of the upper deck. Besides acting as stoppers for cars ,preventing them from falling off, these stoppers can be folded down to act as a near-smooth connection to allow cars from the surface to climb up the upper deck without much resistance. Tigertrack: Darn, I've missed the boat again! Detached and on its own, the earlier mentioned curving-upwards lower deck/trailer bed is now back to its intended position, straight!